Sound travels in waves. Ultrasound is sound that travels at a frequency that is beyond the hearing capacity of man. Using a handheld transducer placed on the skin, ultrasound waves penetrate the tissues and are reflected off the internal structures. The echoes produced are then captured by the transducer and a 2D image is projected upon a screen. Doppler ultrasound utilizes the same principles in order to image blood flow. Continuous Wave Doppler Ultrasound allows your physician to listen to the sound of blood flowing through your vessels. A change in pitch can then provide an estimate of the degree of narrowing in the blood vessel. Color Doppler Ultrasound utilizes two technologies simultaneously. In addition to the standard images that are obtained, Doppler sounds are converted into colors that are superimposed upon the image of the blood vessel representing the speed (velocity) of blood flow through the vessel under study. 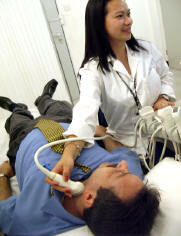 Duplex Doppler Ultrasound also utilizes two technologies simultaneously. With standard techniques, an image of the blood vessels and neighbouring organs is produced. Additionally, the Doppler sounds are converted into a graph that records the speed and direction of flow in the blood vessel under study. Doppler ultrasound is a non-invasive way to image your blood vessels. Your neurologist may request a study of the carotid arteries (neck vessels that provide blood to the brain) or the vertebral arteries (also neck vessels that provide blood to the brain) in order to assess whether there is any blockage (stenosis or narrowing), tearing (dissection) or evidence of thickening of the internal walls of these vessels. This test is usually performed for patients with signs or symptoms of a stroke or for those with unexplained syncope (passing out). Who performs and interprets this test? Whereas this test may be performed by physicians or sonographers, only physicians can provide an interpretation. No preparation is required. You will be asked to lie down on an examination couch. Gel is applied to the area that is to be studied and a transducer is then placed over the region. The images are projected upon a monitor in front of the person performing the procedure and the sound of blood flow through the vessels is heard over the attached loudspeakers. This is a painless procedure. It usually takes anywhere from 30 to 120 minutes or more dependent on the extent of testing and the condition of the blood vessels. Is ultrasound a safe procedure? After several decades of experience with this procedure, there have been no reports of any harmful side effects. Moreover, the procedure has been safely used during pregnancy.